CB Thank You Page Protector is an easy-to-use security solution for ClickBank vendors that protects both thank you pages and product downloads. 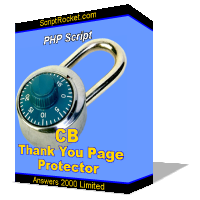 CB Thank You Page Protector is an easy-to-use security solution for ClickBank vendors, and protects both your thank you page and any downloads (eBooks, software, etc.) linked from them. The software is a PHP script that you install on your own website. Unlike most PHP scripts, there is no complicated messing around with configuration files or settings - you simply upload the script to your website then follow the instructions. The software can protect an unlimited of Thank You pages and downloads (you can have multiple downloads in your Thank You pages if you want), and uses several methods to ensure only authorized customers are able to access them. The software generates a basic default Thank You page design for you as a starting point, but you do not have to use it. You can customize the design and content (including all of the HTML) of your Thank You pages as much as you want, and of course, each ClickBank product in your account can have a completely different Thank You page. Additionally, your Thank You page designs can also contain "variables" which are used to insert the customer's name, the date of purchase, the ClickBank receipt number, the customer's IP address, etc., within the text of the Thank You page at appropriate points. CB Thank You Page Protector can also also send an automated Thank You email to each of your customers. This is an excellent way of reducing chargebacks and refunds, as well as telling your customers about other products that you offer. As with the Thank You pages, each product in your ClickBank account can have a different email message associated, each message can be fully customized, and each message can contain "variables", allowing you to automatically send personalized Thank You emails to your customers. Finally, as well as emailing your customers, CB Thank You Protector can also send notification emails after each sale to an email address of your choosing. Once again these can be fully customized for each product, and can contain "variables". Notification emails are a great way to keep yourself or your staff abreast of your sales, or can be used to automatically add customers to third party services which have an email interface - for example, to create an account for your new customer in your customer support or help desk software. Our company, Answers 2000 Limited, is the vendor of this CB Thank You Page Protector, and we sell this product exclusively through ClickBank. You can purchase CB Thank You Page Protector using most major credit and debit cards, or by using PayPal. Although some payment options may not be available for all customers. Disclosure: Our company is the developer and vendor of CB Thank You Page Protector.